Republican presidential hopefuls Ted Cruz and John Kasich have announced they will now co-ordinate strategies against rival Donald Trump. Ted Cruz has said he will cut campaigning in the Oregon and New Mexico primaries to help John Kasich, while the latter will give Ted Cruz a “clear path” in Indiana. Donald Trump responded to his rivals saying they were “totally desperate” and “mathematically dead”. The New York businessman has a clear lead in delegates but may still fall short of the 1,237 needed to win outright. If Donald Trump does not reach the target, the vote will go to a contested convention – where a different nominee may emerge through negotiations among party figures. 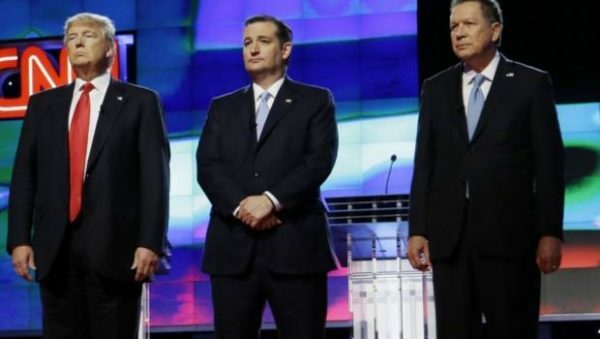 John Kasich and Ted Cruz announced their move in near-simultaneous statements. Some Republican strategists have been urging this deal for weeks but analysts say it may now have come too late to stop Donald Trump. In response, Donald Trump tweeted: “Wow, just announced that Lyin’ Ted and Kasich are going to collude in order to keep me from getting the Republican nomination. DESPERATION! Donald Trump has frequently said the GOP nomination process is “rigged” to favor establishment figures against him. However, the Republican frontrunner did last week promise to change his image, in a closed-door meeting with GOP leaders. The Indiana primary is on May 3, Oregon is on May 17, with New Mexico on June 7. However, before those comes voting in five north-eastern states where Donald Trump is heavily favored. Maryland, Rhode Island, Connecticut, Pennsylvania and Delaware all vote on April 26. Campaigning in Maryland on April 24, Donald Trump said he was confident of avoiding a contested convention. On the Democratic side, Bernie Sanders spoke to a rally of 14,000 supporters in New Haven, Connecticut, on April 24, again accusing rival Hillary Clinton of earning money through “speeches behind closed doors on Wall Street”. Hillary Clinton retains a clear lead in delegates and will hope the north-eastern state votes will effectively put an end to Bernie Sanders’ dogged campaign. Bernie Sanders and Hillary Clinton have traded increasingly hostile remarks in recent weeks.